Race and gender are responsible for none of it, and single parenthood is responsible for virtually none of it. Immigration is responsible for 5 percent. The imagined uniqueness of computers as a transformative technology is responsible for none of it. Tax policy is responsible for 5 percent. The decline of labor is responsible for 20 percent. Trade is responsible for 10 percent. Wall Street and corporate boards’ pampering of the Stinking Rich is responsible for 30 percent. Various failures in our education system are responsible for 30 percent. Most of these factors reflect at least in part things the federal government did or failed to do. Immigration is regulated, at least in theory, by the federal government. Tax policy is determined by the federal government. The decline of labor is in large part the doing of the federal government. Trade levels are regulated by the federal government. Government rules concerning finance and executive compensation help determine the quantity of cash that the Stinking Rich take home. Education is affected by government at the local, state, and (increasingly) federal levels. In a broad sense, then, we all created the Great Divergence, because in a democracy, the government is us. I’m not necessarily endorsing Noah’s percentage breakdowns here — I suspect he somewhat understates taxes and overstates education, for example1 — but assuming they’re in the right ballpark I think you can add one more thing to his analysis. He’s right to point out that government policy — i.e., politics — was responsible for much of what happened. But take a step back and ask what enabled all this government policy. Labor unions have historically agitated for greater access to education, more labor-friendly trade policy, and higher wages for the middle class (which in turn means less for Noah’s Stinking Rich). So in a world in which labor unions were as powerful a force as they were in the 50s and 60s, it’s hard to believe that items 6, 7, and 8 would have evolved the way they have over the past three decades. If even a third of that evolution can be traced to the decline of organized labor as a counterweight to business interests, it means that the fading influence of unions is responsible not for 20% of the growth of inequality, but closer to half of it. I’m not saying this has to be the case. But something like it must be. After all, government policies don’t “just happen.” They happen because various interests duke it out and some of those interests win and some of them lose — and for the past 30 years, there’s been a steady realignment of interests that’s promoted outcomes that persistently favor the well off and disfavor the working and middle classes. So if you want to understand what’s happened you have to understand not just the economic and social trends that have promoted increasing income inequality, but also which interests have flourished and which have decayed and what impact that’s had. The decline of organized labor doesn’t have to play a big role in this, but if it doesn’t then something else does. But what? 1Why? 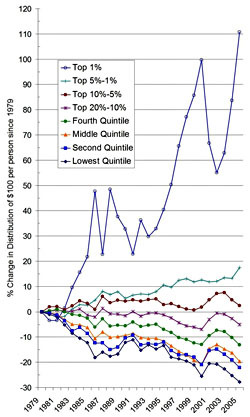 The income of the today’s rich is at least twice what it would be if we still had the tax regime of the 70s, and the enormous income rise of the super-rich is a major part of the inequality story. On education, what matters most from the perspective of inequality is having a college degree, and the U.S. still produces college grads at the same rate as nearly every other advanced economy. This just doesn’t seem like a powerful explanation for the striking difference between the U.S. and the rest of the world.